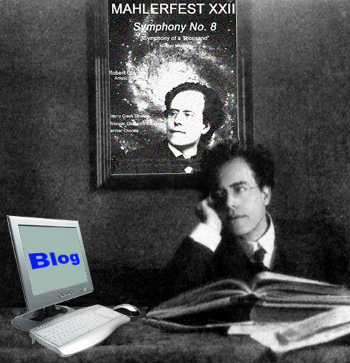 MahlerFest XXVI is here. It is a bittersweet milestone. After a year’s work and preparation, we’re always very excited about our festival, with symposium, dinners, and concerts. But this year we celebrate the truly amazing contributions of a gifted performer and teacher as we bid farewell to soloist, supporter, and friend, mezzo-soprano Julie Simson. The MahlerFest concert program includes two contrasting works by the great Viennese composer: Mahler’s most comforting and genial of works, his Symphony No. 4, with soprano Jennifer Bird, and one of his most personal statements, Der Abschied (Farewell) from his song cycle Das Lied von der Erde (The Song of the Earth), which will be sung, fittingly, by Julie Simson. Julie Simson has sung with opera companies throughout the United States, including Houston Opera, Dallas Opera, Santa Fe Opera, Opera Memphis, and Opera Colorado performing such roles as Hansel in Hansel and Gretel, the Composer in Ariadne auf Naxos, and Suzuki in Madama Butterfly. She has also performed as soloist in major oratorio works with the Denver, Colorado Springs, Cedar Rapids, Omaha and Milwaukee Symphonies and in Boulder at the MahlerFest and Bach Festival. Ms. Simson was the recipient of a grant to study and perform in Europe where she subsequently won the prestigious Mozart Prize at the International Belvedere Competition in Vienna. After winning First Prize at the East & West Artists International Competition, she made her New York recital debut in Weill Recital Hall at Carnegie Hall. Ms. Simson was featured in two concerts at the International George Crumb Festival in Prague Czech Republic, and in recital and master classes at the Hochschule für Musik Hans Eisler in Berlin Germany. 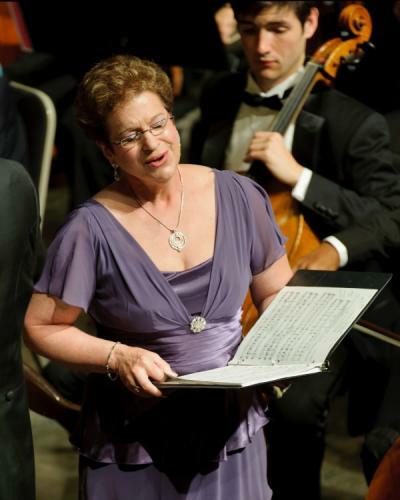 Julie studied privately with world-renowned mezzo-soprano Christa Ludwig in Nice, France. She participated in the Cleveland Art Song Festival at the Cleveland Institute of Music. She has worked with Elly Ameling, Dalton Baldwin, Thomas Krause and Michel Eliason. Her recordings include Nixon in China with Opera Colorado and the Colorado Symphony on the Naxos label, Mahler’s Symphony No. 8 with the Colorado MahlerFest, Horatio Parker’s Hora Novissima on the Albany label, and an Art Song CD on the songs of American composer Richard Faith. Past engagements include the leading role in Midnight Angel by David Carlson with the Skylight Opera in Milwaukee, and the operas La Traviata, Nixon in China, The Tales of Hoffmann, and Le nozze di Figaro with Opera Colorado. Ms. Simson is renowned for her teaching of Voice; she is currently the recipient of the Berton Coffin Faculty Fellowship Endowment and has been a Master-Teacher in the NATS Intern Program. This coming summer she returns as a guest performer and teacher at the Vancouver International Song Institute at the University of British Columbia-Canada. Ms. Simson holds degrees from Western Michigan University and the University of Illinois. After teaching at Iowa State University, Ms. Simson joined the faculty of the University of Colorado at Boulder in 1990 where she is currently Professor of Music. This coming fall, Ms. Simson will be joining the faculty at the Shepherd School of Music at Rice University in Houston Texas where she will be one of three voice teachers in an elite program that admits only thirty-six singers in any given year. The program is designed to cater to the uniquely talented singer pursuing a professional career in classical singing. Houston’s gain is Boulder’s loss! Thank you, Julie, and good luck to you! This entry was posted in Das Lied von der Erde, Der Abschied, Mahler's 4th, MahlerFest, Ron Nadel and tagged Colorado MahlerFest, das lied von der erde, Gustav Mahler, Jennifer Bird, julie simson, Mahler Symphony No. 4, Mahler's Fourth. Bookmark the permalink.